It’s Halloween week and the 35th anniversary of John Carpenter’s 1978 classic that gave new meaning the spookiest holiday of the year, and to celebrate we’re bringing you Part 2 of our exclusive interview with Brian Andrews, who played lovable little Tommy Doyle in the groundbreaking film! We talked to Brian at length this summer about his memories of making Halloween (click here to read Part 1), the genius of John Carpenter, and much more as part of our ongoing “Halloween at 35″ retrospective series, and we found the actor to be both humble and incredibly insightful in our extended conversations. “What do I think of John as a director? He’s way on top,” Brian told us. “You ask me about John’s style? He just sat back a lot. He just had me and Jamie improvise, and we were able to connect. “Once in a while I look at some of my work and I say, ‘Goddamn, I’m overacting,’ but those are the shots John used. Those are the shots he wanted, strangely enough. He could’ve told me don’t do this. He let me go as far as I could. It was a lot of fun really playing extreme like that. Brian remembers that Carpenter had come up with a list of some of his favorite scariest ideas to include in the film. “Supposedly John had got together and made a list of really, really scary things, and the ones they chose, they put in the movie,” said Brain. “Some of the things that I really liked, they put in The Thing That Wouldn’t Die, and obviously Michael doesn’t die. That’s a horror standard, the thing that can’t be killed, can’t be stopped. He says he still marvels the simple effectiveness of the film, even more so now. “When I think of the movie I have to actually replay everything in my mind,” he said. “I like John Carpenter’s graceful camera movement. That’s really under-appreciated. It’s not understood well. “Halloween is fairly appreciated in the horror genre because it’s a big iconic film, and sometimes horror does not get the best wrap, but John’s camera movements are just, the camera is an additional character that guides and leads the audience. “It starts out with the beautiful camera movement itself. Right from the very beginning we’ve got the moving camera, we’ve got the camera in motion, we’ve got action, we’ve got a great plot. Brian also remarked that the infamous ending of the film signals a perfect tragedy. Andrews told us in Part 1 of our interview that Carpenter likely used so many of his own friends in the production of Halloween because it was simply the only way he could afford to complete his ultimate vision due mostly to the shoestring budget. Brian went on to tell us about how the Halloween script alone is a work of art in itself that can and should be appreciated even apart from the finished film. “I recommend if you have a copy of the screenplay, go read it out loud,” he said. “I recommend that everyone read the screenplay. The actual movie is plotted out in the screenplay, shot by shot. It’s storyboarded (in words), when the camera’s going to move forward, when the camera’s going to move back. In the end, the success of Halloween lies in its continued enjoyment over repeat viewings year after year, and Brian believes that is because the film remains a great thrill ride rather than a dated torture chamber. “The whole idea about this movie,” Brian said, “is it’s the setting of a tone and a mood. It’s the setting of the atmosphere, bringing out the element of fear in the audience. “It’s not repulsion at all. A lot of horror movies you see these days, they just want to repulse the audience, but Halloween is a very fun film. After 35 years, Halloween still stands as a monument to cinematic fear, and the young star of the film can’t say enough good things about the director who brought it all to life. We will talk to Brian more about the legacy Halloween and the lingering weight of having survived the night Michael Myers came home in the emotional third and final installment of our interview, coming Halloween week to HalloweenDailyNews.com! 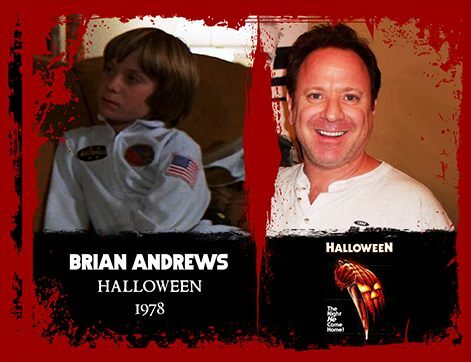 You can watch Brian face Michael again in the original Halloween, currently playing in limited theaters, and you can meet the actor at the upcoming 35 Years of Terror Halloween anniversary convention happening November 15-17 in South Pasadena, California. Be sure to click here to follow Brian Andrews on Facebook.